This report in the Washington Post does not raise any alarm bells, but rather confirms what has been happening for a number of years now. Students feel the pressure and resort to cheating. What makes this so disturbing is the way cheating is done and to what lengths students, together with the help of agents and agencies in China, are willing to go. It is no secret that students have cracked the SAT’s which may be imbedded in Chinese recent history, but now universities have finally woken up. And I am not sure if there is a solution, other than instilling a code of honor in all agents and agencies and students that says, if you cheat, you can’t come in – PERIOD. Concerns about possible cheating on the SAT in Asia have led test overseers to withhold scores for students from China and South Korea who took the college admission exam nearly three weeks ago.The nature and extent of the alleged security breach were unclear Thursday because the College Board and its contractor, the Educational Testing Service, revealed few details about the unfolding investigation. But the score-reporting delay could affect thousands of students seeking admission to U.S. colleges as November deadlines loom for early applications. An international admissions counselor and the leader of an admissions and counseling network told The Washington Post that some students at test centers in other Asian countries reportedly were caught checking smartphones to get cribbed answers to SAT questions while taking the exam. The alleged cheating cast a spotlight on a critical academic pipeline. China and South Korea are the top two suppliers of foreign undergraduates in the United States. There were more than 93,000 Chinese and 38,000 South Korean undergraduates in U.S. colleges in the 2012-2013 school year, according to the Institute of International Education. The College Board has declined to say how many students per foreign country take the SAT. But it is likely that most Chinese and South Korean applicants do. For many, Oct. 11 was a key test date because it was the last administration of the test before early applications start to come due on Nov. 1. Matthew Lee, of Fairfax County, an education consultant for college-bound students in Korea, said his clients were “devastated” when they heard the Oct. 11 results were delayed. Some worry that scores will be invalidated and they will have to take the test over again. “They worked so hard over the summer,” he said. Lee said some parents wonder if their children should register for the test in another country, in case colleges harbor any suspicions about scores from tests taken in South Korea. The College Board, a nonprofit organization based in New York, sought to allay concerns. It said scores “will be returned as quickly as possible” in November. “The College Board will make universities aware of the circumstances and can supply students with a letter to share with the schools to which they are applying,” the organization said in a statement. At George Washington University in the District of Columbia, which recruits heavily from China and South Korea, a senior official said that a delay in score reporting would not disadvantage applicants from those countries. “We don’t want prospective students who’ve done nothing wrong to be worried about a negative impact on their applications,” said Laurie Koehler, GWU’s senior associate provost for enrollment management. The College Board said the SAT is given in more than 175 countries, at more than 1,000 testing centers outside the United States. The only testing allowed in China, officials said, is at international schools. That means Chinese students typically go to Hong Kong or another country to take the SAT. Scores are being withheld for all Chinese and Korean residents, according to the College Board, regardless of where they took the test. College Board and ETS officials said the rules for test administration are no different whether it is given in San Francisco or Seoul. Cellphones and other portable computing devices are prohibited, with an exception for approved calculators during the mathematics assessment. Test proctors enforce rules, sometimes with help from private security firms. Exactly what prompted the investigation is unclear. The College Board/ETS statement on Wednesday denounced “organizations that seek to illegally obtain test materials for their own profit, to the ultimate detriment of all students.” That indicated a concern that test questions were circulating illicitly in advance or during the exam. Paul Kanarek, a senior vice president for the test-preparation company Princeton Review, which has operations in Asia, said the educational culture in China and South Korea puts a huge premium on test scores. He said some tutors will try any tactic, including stealing questions in advance, to help their students get an edge. “There is enormous pressure and incentive to take advantage by hook and by crook,” Kanarek said. On Thursday, there were signs that test integrity questions were being raised outside of South Korea and China. Joachim Ekstrom, a counselor at NIST International School in Bangkok — a site where some Chinese visitors took the test — wrote in an e-mail that one student was caught using an iPhone. Tom Ewing, a spokesman for ETS, said he could not discuss specific reports of possible cheating. He also declined to elaborate on the scope of the investigation. “We’re really not . . . detailing how many students are affected,” he said. Michael Alison Chandler contributed to this report. how is this any different from anyone else giving money to support higher learning by supporting any given university…? they are being blamed at home for “taking money away from the chinese students and giving it to america…” this sounds a little bit too much like old school communist thought to me… after all, whom would they be giving the money to in china..? 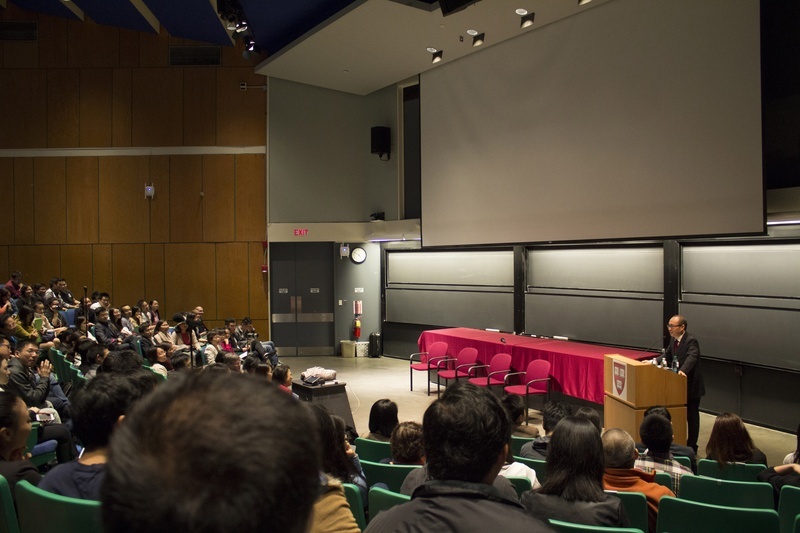 Co-hosted by Harvard China Fund and several Chinese students’ groups on campus, Wednesday’s event was conducted mostly in Chinese because many audience members were Chinese nationals. Some Chinese students have reacted positively to the scholarship. “It’s going to have a lot of ripple effect[s]…. I would expect more and more donors coming from mainland China to replicate this,” said Sicong Shan, president of Harvard Chinese Students and Scholars Association and a student at the Graduate School of Arts and Sciences. HCSSA was one of four co-hosts of the event. “This is a better way of using their money than if they go and purchase more real estate [properties],” said Yang Du, another GSAS student who attended the event. Tianxing Lan ’18, one of the eight beneficiaries of the donation, said the total amount of financial aid that he was receiving from Harvard was not increased by the SOHO China Scholarship. “I think for now, there hasn’t been a big influence on whether more Chinese students will apply to Harvard, because you can get financial aid anyway,” said Lan, referring to Harvard’s need-blind admissions and need-based financial aid policy for international students. “But if they continue to give money to schools that don’t give a lot of financial aid to Chinese students such as Stanford and Duke, that would influence people’s decisions to apply to those schools,” Lan said. —Staff writer Zara Zhang can be reached at zara.zhang@thecrimson.com.